The one-and-only A.E.G. (Algemeine Elektrizitats-Gesellschaft) Flugboot with 150 hp Benz Bz III. At the beginning of the war the machine was taken to the marine station Kiel-Holtenau where it crashed after a short time of use. The machine was not continued and written off. THE A.E.G. MONOPLANE FLYING BOAT. IN our issue of September last and following issues we gave a series of illustrated descriptions of various German seaplanes, among which was, it may be remembered, the A.E.G. 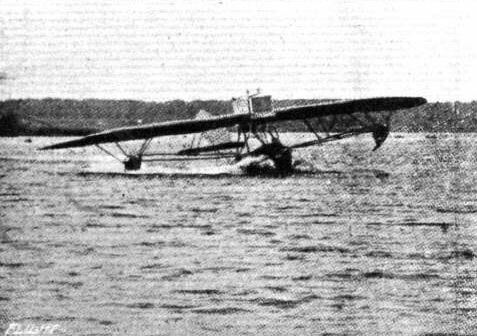 tractor seaplane. Particulars are now to hand of a monoplane flying boat built by the same firm and entered for the Warnemunde Scandinavia Seaplane Race, which was postponed on account of the war. The aeroplane portion of the A.E.G. 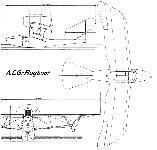 flying boat consists, as will be seen from our illustration, of a pair of monoplane wings having slightly back-swept and upturned wing tips after the fashion somewhat of the Taube land machines. 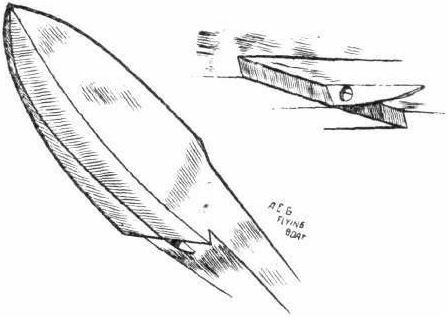 The upturned tips are not, however, extensions of the framework of the main planes, but take the form of hinged ailerons and serve to maintain lateral stability. The wings are built up of wooden ribs over steel tube spars. 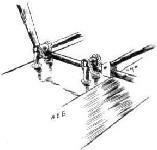 Instead of the cable bracing usually associated with machines of the monoplane type, there is in the A.E.G. a sub-structure in the form of a girder underneath the wings. On each side two booms, which are virtually steel tubes, run from the gunwales of the boat to a point some distance inside the wing tips. In order to keep them clear of the water these booms slope upwards towards the outer ends, where are carried the wing tip floats to which reference will be made later. From the booms streamline steel tube struts run to points on the front and rear spars of the main planes, to which they are secured by means of the ball and socket joint that forms the subject of one of the accompanying illustrations. The strut, it will be seen, terminates in a spherical head which fits into the conical socket on the wing spar or outrigger booms, as the case may be. This head has cut through it a slot tapering towards the centre of the ball, where it accommodates a small bolt passing through the sides of the conical socket. In one direction the ball, and with it the strut, may be oscillated through a large arc, as the ball is in this plane concentric with the bolt. On the other hand, the tapering slot allows of moving the strut in the opposite direction through an angle proportionate to the length of the tapering slot in the ball. The conical socket is enclosed on two sides by a steel plate which passes round the spar or outrigger, to which it is secured by welding. It is thus possible to mount the strut at a variety of different angles, which is an advantage for experimental purposes when it is desired to find the most favourable position for the wing tip floats, and also facilitates folding the wings for transport or storage. 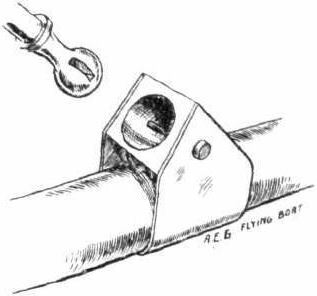 These floats are mounted flexibly on the outer ends of the outrigger booms by means of rubber bands taken round extensions of the booms and round four steel tube fittings having the shape of an inverted U and secured to the top of the floats. Additional springing is provided by the spring boards mounted underneath the flat bottom of the floats. Mounted on a strong structure of streamline steel tubes running down to the centre of the boat is the engine - a 150 h.p. Benz - which is totally enclosed on the sides by an aluminium and fabric housing attached to the inner ribs of the main planes. In front of this housing is mounted the radiator, whilst the rear is left uncovered to facilitate the escape of the air and exhaust gases. Inside the housing, between the radiator and engine, are mounted two small tanks, one of which contains the lubricating oil, whilst the other is the petrol service tank. The main supply of petrol is carried in a larger tank placed down inside the boat behind the seats. A cabane of steel tubes rests on the struts carrying the engine and run up through the engine housing, through the roof of which it projects slightly. Two large rings or eye bolts at the upper end of the cabane members serve to receive the hooks of two strong cables, by means of which the whole machine can be lifted out of the water. The main float or boat is of the single step type, and runs to a point in the bow, while at the stern it terminates in a vertical knife edge. The portion of the boat bottom in front of the step is V-shaped near the nose, flattening out gradually towards the step, where it becomes quite flat. The rear part of the boat from the step to the stern is perfectly flat-bottomed. Inside the cockpit, which is situated just ahead of the front engine struts, are arranged the two seats, the occupants of which are protected from water spray and wind by the curved front portion of the deck. Six bulkheads divide the boat into seven water-tight compartments, the first bulkhead occurring in front of the cockpit, the second one behind the cockpit, between it and the compartment containing the main petrol tank; the third one occurs immediately over the step, and the remaining ones are placed at regular intervals back to the stern. 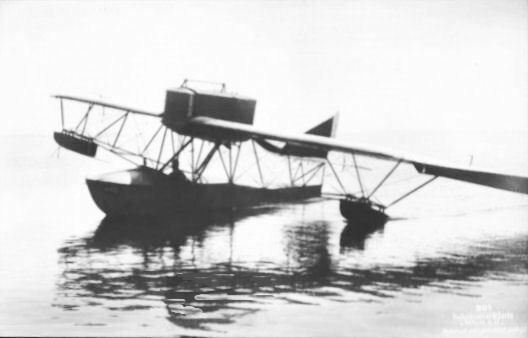 At the rear, mounted on a somewhat frail-looking structure of steel tubes, are the tail planes, which consist of an approximately triangular shaped fixed horizontal plane, to which is hinged the undivided elevator, surmounted by a vertical fin, to the rear edge of which is hinged the rudder. The A.E.G. flying boat starting for a flight. The new German A.E.G. 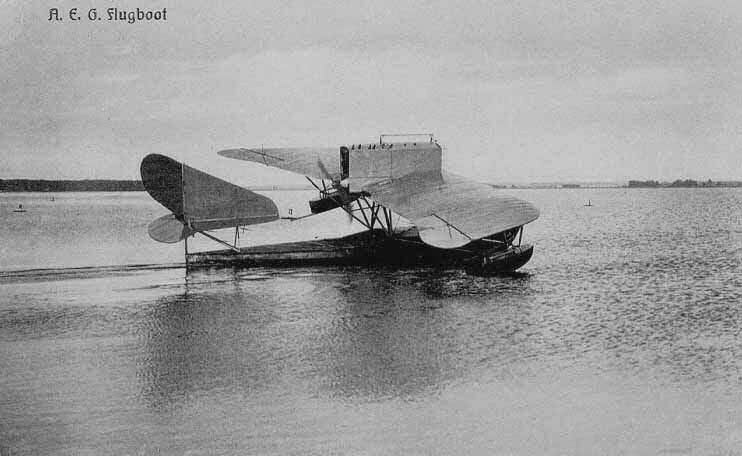 flying boat, built just before the commencement of the War. View from underneath of the front portion of the boat, and rear view of step. The ball and socket strut joint employed in the A.E.G. flying boat. 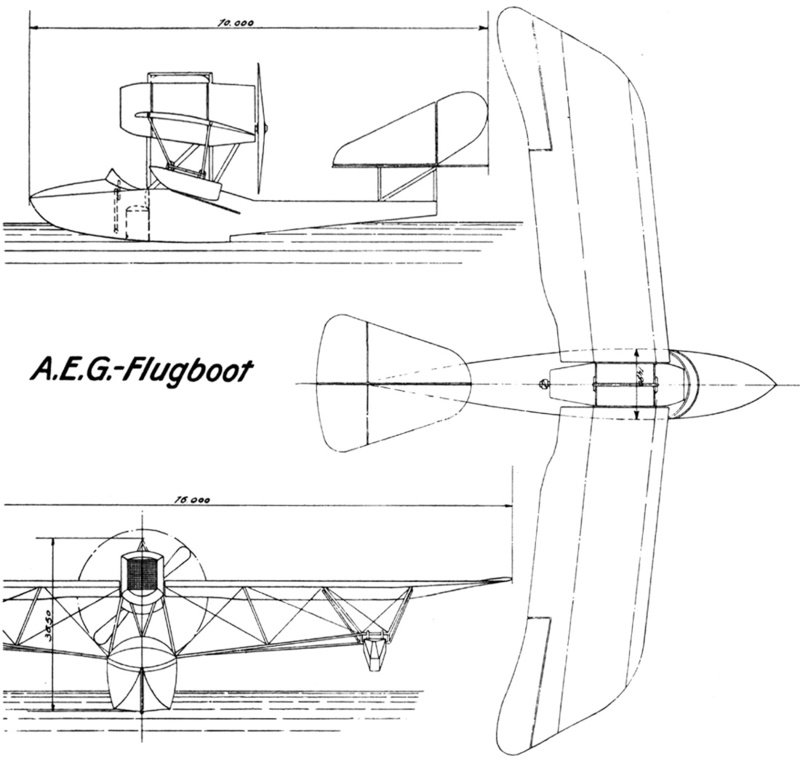 Sketch showing suspension of wing tip floats.